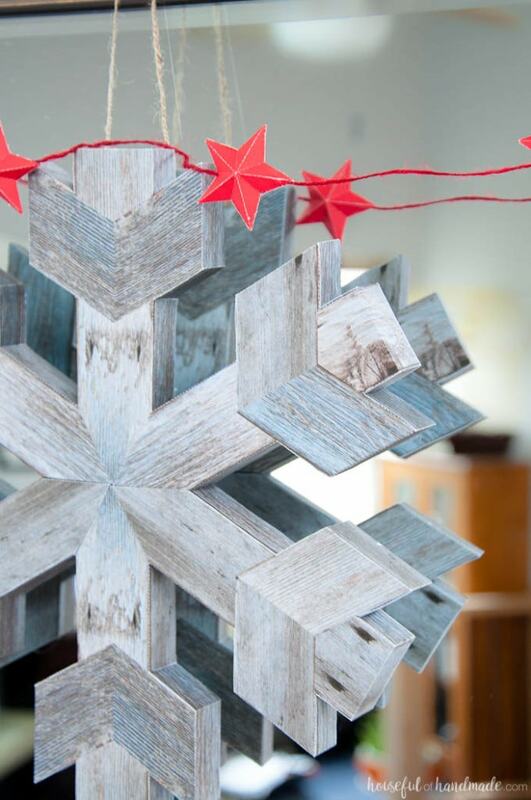 You may be asking “Why is it a faux wooden snowflake?”. It looks just like it was made from wood… but it isn’t. 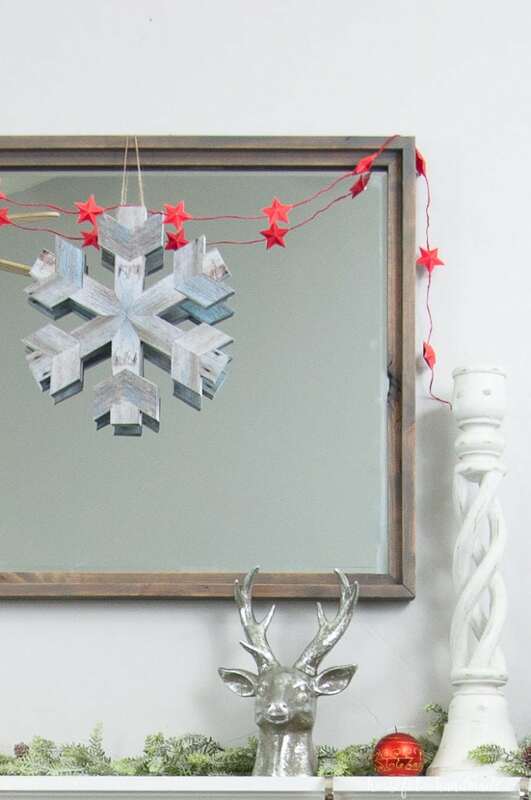 There were no power tools used in the making of this snowflake because it is made out of paper! I think I might actually be addicted to creating amazing things out of paper that you wouldn’t expect. 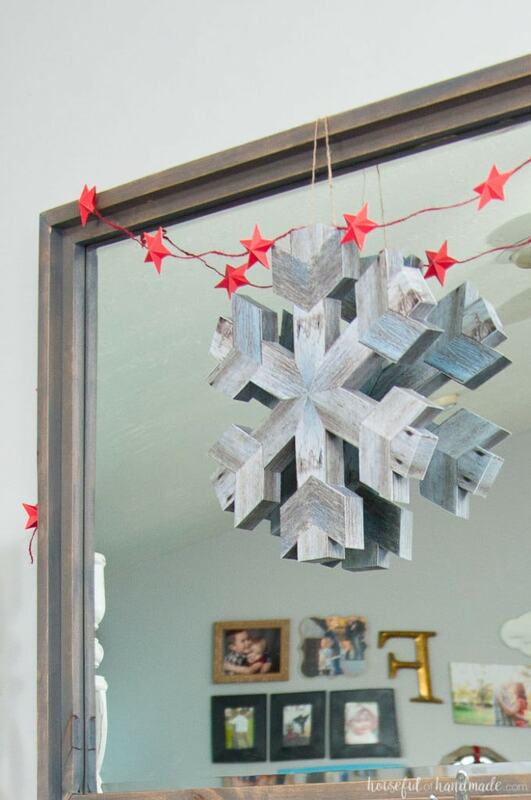 After making this Anthropologie mirror knock-off, I was ready to see what else I could do with paper and this faux wooden snowflake decor was born. Before you think that this snowflake doesn’t look as awesome as it does in the photos, I promise it does. My sister was visiting the other day and we were talking about the different finishes on the projects in my living room. She pointed to the snowflake and asked what I used to finish it. I pulled it off the mantle and threw it at her laughing, “This one is made out of paper” as she frantically tried to catch it before it hit her in the head. Sitting in the room with me she had no clue the snowflake wasn’t made out of wood! The secret to the rustic wood finish is the design that is printed on the template. So it is even easier to make. 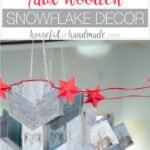 You will need to have access to a printer, but then you can make loads and loads of faux wooden snowflakes. I did use my Silhouette cutting machine to quickly cut out the design, but it isn’t necessary. I love my Silhouette for making quick work of cutting out my paper crafts and so much more. If you don’t have a cutting machine yet, I also include a PDF of the design so you can print and cut the old-fashion way. I never would have guessed these were made of paper!! What a great project. Love them! Thank you Amy! I might be slightly obsessed with making things out of paper lately. I wouldn’t have EVER thought it was made from paper. That’s awesome! Thank you for sharing at Merry Monday! Thanks so much Amanda! It’s been fun to see what I can create out of paper. That is amazing! I, too, love using paper as a medium. It’s so fun to see what you can make with such an everyday material. Awesome, awesome job! Thanks Kim! I agree paper is so fun to manipulate. I never would have guessed it was made out of paper! That is SO cool! I can’t believe it’s paper!! How cool!